Have you ever flipped through a magazine, or a newspaper and came across an ad that just had TOO MUCH STUFF on it? I know that I have and sadly, it happens all too often. It seems like so often, a business owner will sit down and look at the space that he is given to advertise his business and think to himself “Since I am paying for the space I need to put as much information on this ad as I can,” but this can be one of the worst things a business can do. Too much information = too much clutter = No one will stop and look at your ad! I would like to share with you some of my secretes to creating a clutter free ad; whenever I start working with a new client we will always go over the following goals and steps. Come on, play along with us. Write down your goals and follow the steps as we go and by the end of this article you will have created a clean, readable, EFFECTIVE ad. What are your goals with this piece of Advertising? Sometimes it can be all three, and there are occasional exceptions, but as a business owner who is putting together an ad, you should always ask yourself which one is your primary objective. What is your Secondary Goal? What do you want your customers to do? Call…Come In… or go to a website? When your potential clients knows what you want them to do, they will be able to either call or come in to find out answers to their specific questions. The majority of businesses will see a better ROI when they have potential customers call or come in. With these 2 methods the business owner can ask the right questions and help solve their customer’s problem. What Message would you like to use? 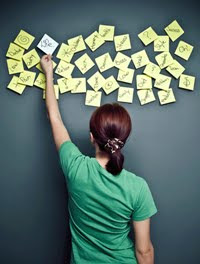 Keeping your goals in mind, make a list of everything that you would want to put on an ad. For the purposes of this exercise, I’m going to create a list for a pizza restaurant. WOW that’s a lot of information! Keeping your goals in mind, choose your top 10 most important points and number them in order, with 1 being the most important. Voila! That is it you have created a clutter free ad that works and gets all of your needs met. As a small business owner is it often hard to figure out what needs to be in ads. What are the most important things to get across because we understand the language of our own business, while everyone else does not. Thanks for these great tips and for the example it makes it easier to understand. I’ve seen the cluttered ads and its visual harassment! Good layout and clear message are vital for an ad to be effective. Thanks for the tips! I appreciate your expertise in the matter. Previous Previous post: Why is Customer Retention Important?